Much of my current research is done in partnership with students and community partners through the Community Mapping Lab. More information on those projects is available the lab's website. A few selected projects are highlighted below. You can also browse my peer reviewed publications. This USDA funded project extends the Georgia Initiative for Community Housing (GICH) program to examine how actors within Georgia's small cities work together to develop community revitalization projects. My section of this project focuses on developing mostly open source tools for community housing assessments and related materials that support community organization around developing affordable housing. My collaborator on this project is Dr. Kim Skobba (PI). Dr. Karen Tinsley also contributed significantly to this project. I am collaborating with Dr. Sarah Shannon (PI), Dr. Jung Sun Lee, and Dr. Grace Bagwell to analyze data on SNAP enrollment in the state of Georgia from 2008 through 2013. Our analysis at the county and zip code level considers a variety of factors that shaped enrollment patterns and assesses the effects of increased enrollment at the local level. Currently, I am continuing to develop data on the growth of SNAP authorized retailers during this time frame, analyzing patterns in Atlanta and developing a national dataset. This project has been funded by the RIDGE Center for Targeted Studies. With financial and logistical support from the Atlanta Community Food Bank, I and others at UGA helped conduct an innovative, mixed-methods, and participatory research project with five agencies serving food insecure households in Metro Atlanta. By combining focus groups and interviews with an adapted form of the photovoice methodology utilizing hierarchical cluster analysis, we identified key factors shaping agency clients' lives and relationships with food pantries. The results of this research will inform future changes in agency practice and speak to the social capital and everyday agency demonstrated by clients. Kurtz, H., Borron, A., Shannon, J., Weaver, A. (Under review). Community food assistance, informal social networks, and the labor of care. Submitted to Agriculture and Human Values. SNAP-Ed is a federally funded program designed to provide nutrition education for low-income households. The University of Georgia administers this program within the state. As part of this project, I am using data from Georgia's Dept. of Family and Children's Services alongside census data to determine enrollment patterns throughout the state. I am also drawing upon several data sources to map access to food sources and county health offices statewide and determine areas of categorical eligibility. 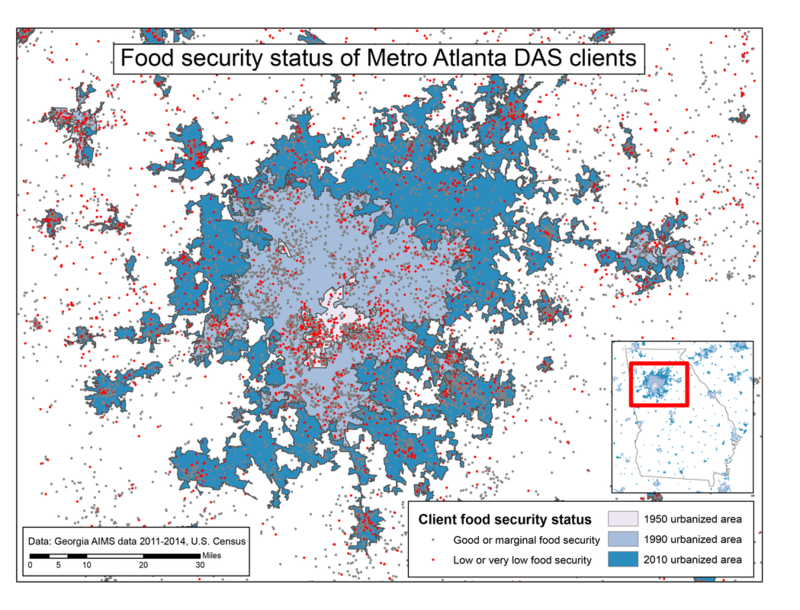 ﻿Working in collaboration with the Atlanta Community Food Bank, I and Matt Hauer developed census tract level estimates of food insecurity rates for Georgia. We did so using two methods for triangulation: fixed effects models based on historic Current Population Survey data and demographic metabolism. Our results emphasized that while food insecurity rates will remain especially high in the core Atlanta metro and sections of southern Georgia, rates will increase most significantly in the Atlanta suburbs over the coming five year period. Increased food inscurity is thus one more effect of the increasing suburbanization of poverty. Along with Dr. Jay Christian at University of Kentucky, I am analyzing data from the Twin Cities Metropolitan Council's Travel Behavior Inventory. Using this data, we hope to identify household and neighborhood level drivers influencing how and where individuals eat out and shop for food. I provided spatial analysis of data on the urban context, food environment, and food security of clients in the state’s Department of Aging Services programs. We found a significant association between food security and both historical urban development and food environment. The PI of this project was Dr. Jung Sun Lee. Lee, J. S., Shannon, J., & Brown, A. (2014). Living in food deserts was associated with food insecurity in a statewide sample of older adults in need of aging and food assistance programs in Georgia. Journal of the Academy of Nutrition and Dietetics, 114(9), A12. 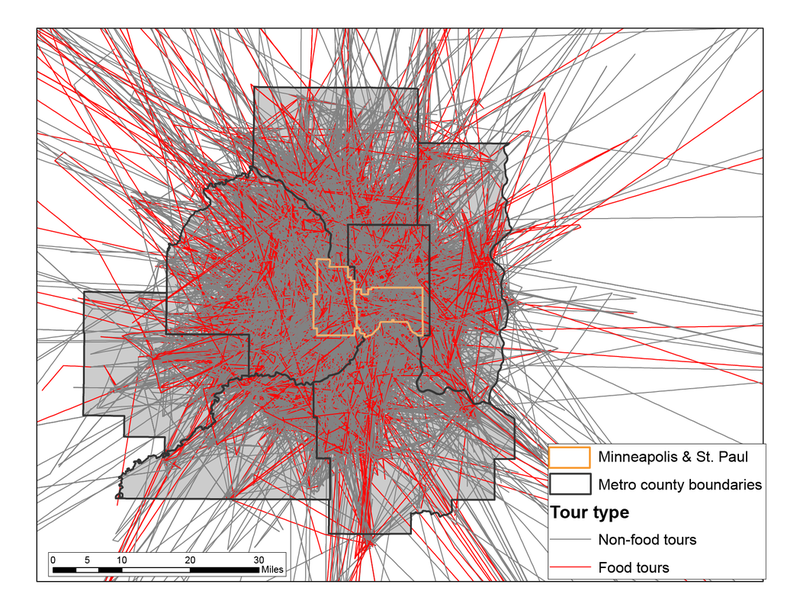 My dissertation research, based in the Twin Cities, examines the range of factors influencing food procurement in low-income urban neighborhoods. See this page for a initial results of this project. An online version of my SNAP data is available here. Shannon, J. (2015). 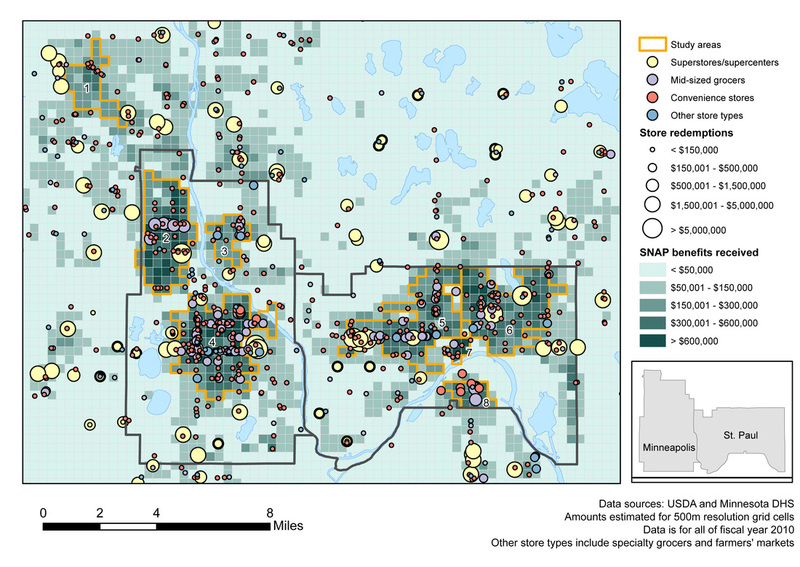 Rethinking Food Deserts Using Mixed Methods GIS. CityScape, 17(1), 85–96. Shannon, J. & Harvey, F. (2012). Modifying Areal Interpolation Techniques for Analysis of Data on Food Assistance Benefits. In S. Timpf and P.Laube (eds.) Advances in Spatial Data Handling. Springer: Bonn, Germany. 125-141. This project, whose PI was Dr. Valentine Cadieux, collected viewpoints on the creation of a regional food system from residents of Southeast Minnesota. We used both Q method and interviews to develop these perspectives. I helped to create the research design, facilitated online survey data collection, and collaborated on the analysis and publication of results.